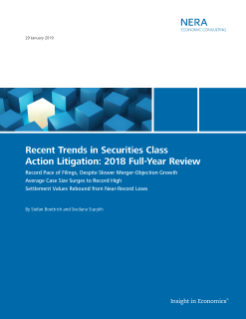 NERA economists in the US, UK, and Canada have released revelatory new analyses of securities and finance patterns in their respective countries. Who’s Who Legal has recognized 16 of our competition consultants as among the best in the world in 2019, and four more as future leaders in the field. A federal jury sided with Korean ramen companies in a rare antitrust class action that featured expert economic analysis and testimony by Dr. Alan Cox. The Massachusetts AG’s Office and FTC cleared a path for the merger, which featured expert analysis and testimony from Dr. Subbu Ramanarayanan. Managing Director Dr. Yves Hervé, Associate Director Amanda Pletz, and Director Sébastien Gonnet lead a transfer pricing webinar on profit splitting in a range of sectors. How is power generation shifting? What are the trends? Where are the gains and losses? Check out NERA’s Electricity Insights for Q2 2018 for answers.